With July several days in, there are some compelling free agents still on the market. Teams looking for an edge may be doing a little shopping in the coming days. 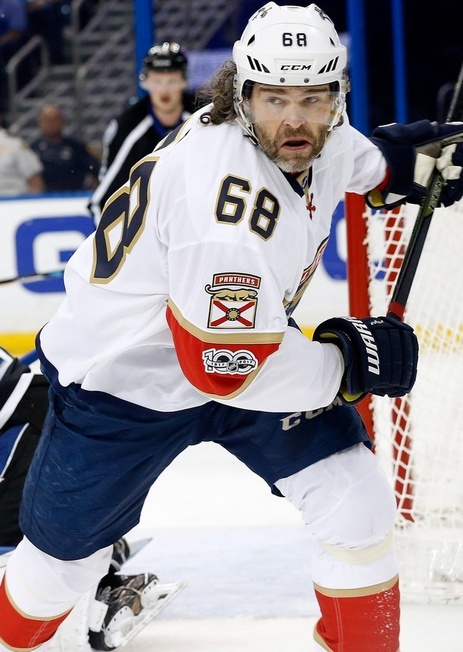 At the top of most lists is Jaromir Jagr, the 45-year-old who has proven his capability year after year. Jagr has serious upside, but signing him is not a risk-free venture and that may explain the delay. We’re talking about a player who led the NHL in even-strength scoring rate in 2015-2016, notching 2.70 points every hour. In the same season, he became the oldest NHLer to lead his team in scoring. Things slipped a bit last season in Florida, but he still produced 46 points. There are a number of factors that could account for the drop in production, including the absence of linemates Jonathan Huberdeau and Aleksander Barkov for a combined 72 games, but most projections have him striking out at around 40 points again. That, then, becomes the issue. How much money do you pony up for Jaromir Jagr if he’s worth 40 points? There are some teams in the discussion and he was still analytically better than most second line wingers in the NHL, plus he can protect the puck like anybody’s business and is probably only asking for a year-long contract at a modest rate of pay. Jagr, at this point, would be a decent fit in a number of places. Nashville, for one, could use a replacement for James Neal. Montreal could pair him up with Tomas Plekanec. And St. Louis could be in the market for a natural right winger to back up Vladimir Tarasenko. Among the other older gems in the pile is Andrei Markov. The 38-year-old had 36 points for Montreal in 2016-2017, but his value is beyond the scoreboard. Markov kills penalties and plays a two-way game comparable to anyone in the modern game. He skates against top opponents and is responsible at both ends of the ice. Plus, he can make it happen in the shootout. Seriously. The reason Markov hasn’t been lapped up by the Habs at this point appears to come down to green. The defenceman is asking too much, according to Montreal management. With Alexander Radulov already moving on after making “high” demands, it may not pay off for the Canadiens to stick to their guns with Markov. What’s more, Montreal has a decent amount of cap space to go and a big, big hole up the left defensive side. Their blueline depth is kind of questionable, if we’re being honest. Marc Bergevin may have a lot of faith in Karl Alzner, but Markov would be a more stable draw. There are other wily vets in the free agent mix, like Jarome Iginla and Shane Doan. Both are 40. Both scored 27 points last season. Both are big heart players. Iginla put up career-low totals in 2016-2017 and will likely not bounce back. But here’s the thing: dude can still anchor a depth line and come through with 20 points in a pinch. He’ll still drop the mitts and solidify the dressing room of a team in need. Likewise Doan, who played well in a secondary role in Arizona – even as the Coyotes were moving in a more, let’s say, analytical direction. Doan’s place in modern hockey may not be long-term, but it’d be wrong to say he can’t play a role somewhere out there. Ask Christian Dvorak and Brendan Perlini about the former Coyotes captain.